in my community, the usernames might differ a lot from the given name. The results to a search also consider the given name, even though it is not displayed. If someone looks for the given name Robert and finds only @asdf2016, it is not be evident that this is actually Robert. Hence, I suggest to add (if different from username) next to the username on the same line the given name in smaller letters. After 1 year, I eventually got the discourse dev environment with Vagrant running on my opensuse maschine. include_name? is already there, but I don’t know how this is used. It’s a magic trick to determine whether name should be included by the serializer. If it’s true, you can find that field in the JSON. After that, Ember model and widget kicks in. Try console.log(u) in that function so that you can see what’s in the u. You could access name by u.name there. And you’ll need some class for colors probably. There is a site setting for displaying order of username and name. You could check that site setting and putting the name there. There is no u.name. I made sure to have enabled names. In the rails console, SiteSetting.enable_names? gives true. Er, you can amend , name right after the end of attributes :id, :username, :avatar_template. Not sure why it’s not there though. Now it is working! The name is not included if BasicUserserialiszer#include_name? evaluates to false. enable_names is two-sided? I thought it’s a global server-side setting. Yes, you can find this setting in client side. See widgets/hamburger-menu for how to access site settings. I got the option enable_names on the client-side working. 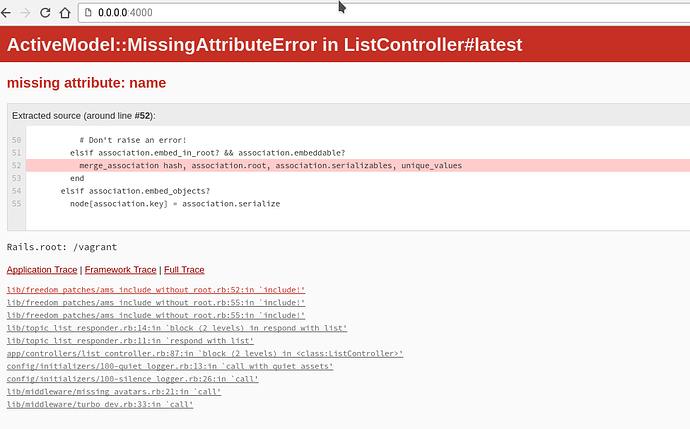 Unfortunately, the attribute :name in the serializer seems to cause issues that I couldn’t track down yet. I could imagine that a database query has to be modified to select as well the name field. hi! I just worked on this issue and submit a PR for it. Thanks! Could you please include a screenshot in your post of how the search looks with you PR added? I found it nice and clean to just wrap the name in parenthesis but if we think is not so important information, we could also do it smaller. If user didn’t give his/her name, nothing will be display. in any case, I like the differentiation by font-weight/color. Absolutely, we should try to keep the display as consistent as possible with the site setting. Still linking to username of course, but dropping the link styling, since the interactivity is obvious enough in the context of a search drop-down. THEN, also display Full Name first in drop-down-search results. currently the username is not in bold. 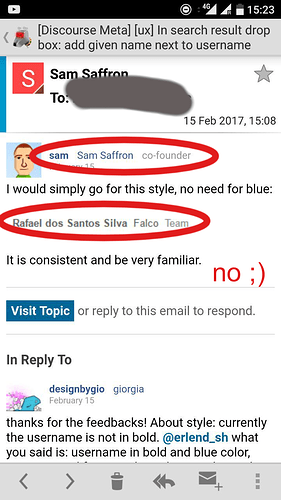 username in bold and blue color, name normal font-weight and grey color. Honestly, I’m not sure about blue + grey. I try that solution but i personally didn’t like. Is there any other place in the app where these style is already used? As Sam said, i want to keep consistent with other style but i didn’t find any place where these style is used. It is consistent and be very familiar.